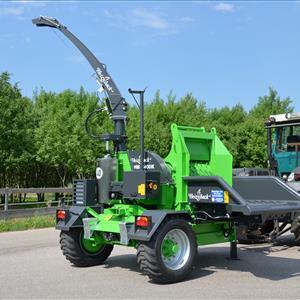 A new very powerful trailer design for professional use in heavy transport and handling in connection with thinning and final felling. Well suited also for managing large volumes of timber. Solves all common lifting and transportation needs on the farm and in other activities. Performance and functionality is in the highest class. MOWI's articulation and engineered woods bogie allows the cart to a complete rig together with the superbly powerful rear end with a well protected rear lights embedded in a third bunk. Telescopic support legs as an option. Load capacity of 12 tons and loading area of 2.7 sq. m. MOWI 1250 can be equipped with parallel input crane MOWI 400 (range 6.2 m, 480 kg lift capacity at full height) or MOWI 4567 (range 6.7 m, 525 kg lift capacity at full height). Both models have unique MOWI-scale, easy to drive, high accessibility, stable and secure.